There were several clever, interactive displays at the museum. This one demonstrated the difference between an alternator and a generator. 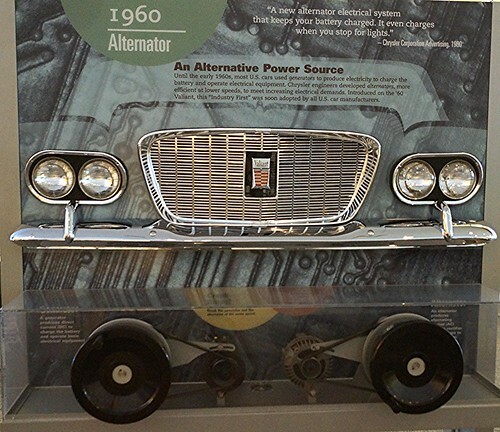 The 1960 Valiant was the first mass produced car to come standard with an alternator instead of a generator. 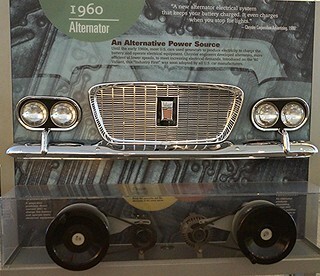 The exhibit contained the bumper, grille and most importantly headlights of a 1960 Valiant. At the bottom were two wheels; the left one connected to a generator and the right one connected to an alternator. You could spin the wheels to power the low beam headlight above it. Spinning the generator as fast as I could make the left headlight glow slightly. The alternator wheel did not need to spin near as fast to obtain a nice glow from the right headlight. Or here for my Car Crazy Tumblr site. Back on November 4th, Hemming's Blog posted an article about the closing of the Walter P. Chrysler Museum . I had missed a couple other opportunities with the WPC Club and others to get into the museum, after it had closed to the public. I did not want to regret missing this last chance to see all of the vehicles before being spread out to other facilities. I trekked from Western Minnesota to Eastern Michigan during Winter Storm Decima. I missed the worst parts of the storm, but still had to endure the aftermath winds, sub zero temperatures and a lake effect snow storm. The trip was difficult, but well worth it. I got to see several Chrysler Corporation concept and show cars that I had only seen pictures of before. There were several clever interactive displays demonstrating various innovations over the years. Since it was the last chance, I duplicated several shots using different camera settings to see what produced better results. I wish I had invested in a strobe light diffuser for all of those indoor pictures. I have not had much experience or success in the past with indoor car images.